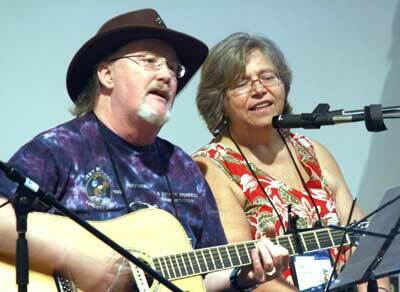 We perform a number of original songs, as well as music we have gathered from other filkers. We also perform a number of traditional and modern folk songs. Eventually we hope to have lyrics and samples added to the web site. In the meantime, two of our songs are up on Filkarchive. Here is a list of some of the songs we often perform. The Big One - Tom wrote this for his favourite show "Meteorite Men"
A Fairytale Romance - you know what happens in fairy tales, don't you? Gone Filkin' - Tom's classic! GPS Queen - a parody ttto Roller Derby Queen. The Stone Dragons - where have all the dragons gone? * These songs are likely candidates for our first CD!